Ripped Jeans and Japanese Dreams:Finding "The One" — Anna Akbari, Ph.D.
Ripped jeans can have their place – but maybe not right inside the thigh. I felt quite accomplished after making dinner on a wintery NYC evening. I grabbed my bowl of pasta, dropped on a healthy serving of tomato sauce and sprinkled some shredded mozzarella to top it off. With a sigh of relief and a grumbling tummy, I plopped contentedly onto my couch, only to instantly hear the ever-so-screeching rip of my jeans as I hit the firm cushions. My stomach was no longer the only thing that was grumbling. That was the sound of my favorite skinnies ripping — Levi’s, well-fitted, made from light-washed denim sans those heinous pre-distressed markings and whiskers right below the hip. Those were my last pair of good jeans — and it had only been a year since I bought them. Coincidentally, during the previous week, three other pairs of my beloved denim jeans had also met their end – all of those were also bought within a two year period. I was now down to my last resort: a pair of emerald green velvet leggings, elastic band and all; the only acceptable legwear that I could trot around NYC in without being a fashion faux pas. What was a girl to do now? Denim eventually went through the fashion pipelines over the next century, becoming a staple in defining American heritage. During the booming economy of the 1980s, the iconic Calvin Klein ad featuring a young Brooke Shields pushed the denim demand even higher. To accommodate the high demand while retaining high profit margins, the majority of denim factories closed their quarters in the U.S. and moved overseas. 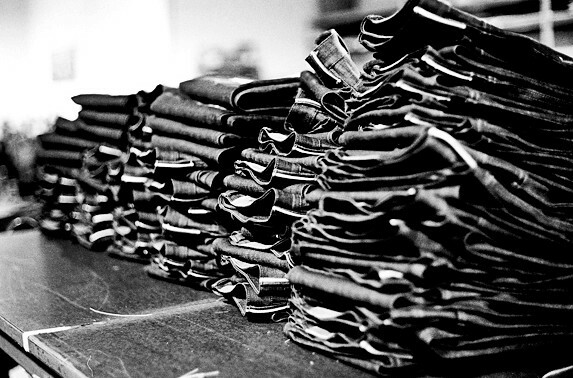 Today, only a handful of denim factories exist in the States, like Cone Denim in North Carolina. Pre-distressed jeans have become the standard for denim. They’re easier to mass produce and it allows sellers to shoot up the price and tag the style as a “vintage look.” I was determined to find the perfect pair of jeans – ones that were of good quality and embodied my style instead of conveniently giving me one to conform into. Frustrated about my pant-less future, I went on a mission to find the perfect pair of jeans the next day. They had to fit perfectly, they had to be made from a thick, durable denim, and above all, they had to be made in the USA. To add to the romance, I wanted the jeans to conform to my body grow old with me, and fade in all the right places. I had just ripped $350 worth of jeans. With that much cash (hopefully less), I figured I could buy a high quality pair of jeans — just one, and hope that they will last at least three years of wear. Denim was essentially made to last and endure rigor. With that in mind, I set off on my journey to find my second skin. I explored a dozen stores — all with notable denim brands — touching the denim, examining its cotton consistency, color, distressed washes and stretch. More than 90% of the jeans that I saw were made in Asia. Where were the good old American-made jeans?? “Most of the stuff in Japan is untreated, unsanforized,” which gives it that raw quality. Raw denim is untreated denim. This means that once it is dyed and stitched, it is not washed and pre-shrunk like most denim, giving it a crunchier feel. Using vintage machines and methods makes selvage (self-edge) denim—the unique stitching along the inside of the jeans where the two sides of the fabric connect. This is a natural effect of the weaving process when using vintage, narrow looms. The new machines are wider and make multiple sides of a jean on one loom, which caters to mass production. But the older machines only allow you to make one side of the jean at a time. And each loom requires individual attention, whereas in mass production, one worker can control fifteen machines at once. Heffner also went on to talk about the dying process. The indigo that is widely used to dye denim is chemically made. But pure, plant grown indigo is still used to make denim, allowing it to deteriorate over time more naturally. 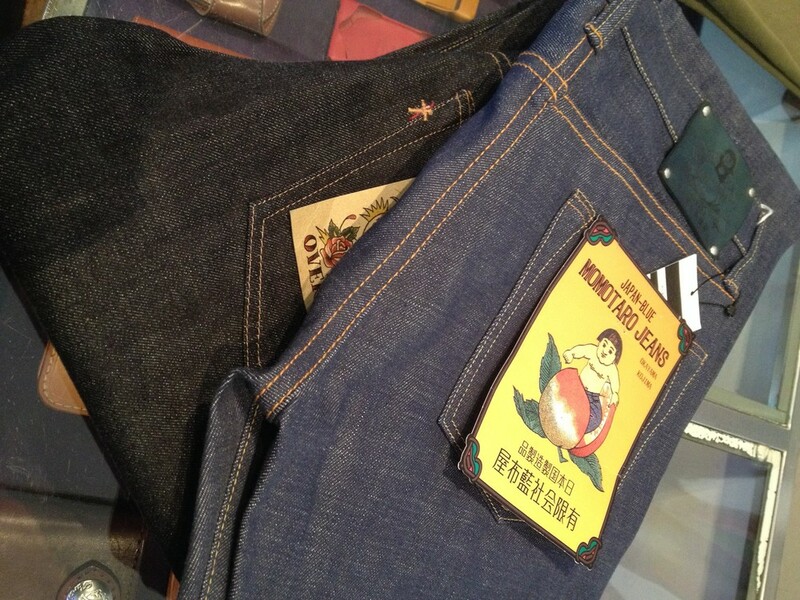 It’s a more laborious practice requiring a craftsman’s eye, increasing the quality and price tag of the jeans. I tried on a few pairs of the Japanese-made denim at Blue In Green. I could feel the crunchiness and heavy weight of the denim that defined its superior quality. 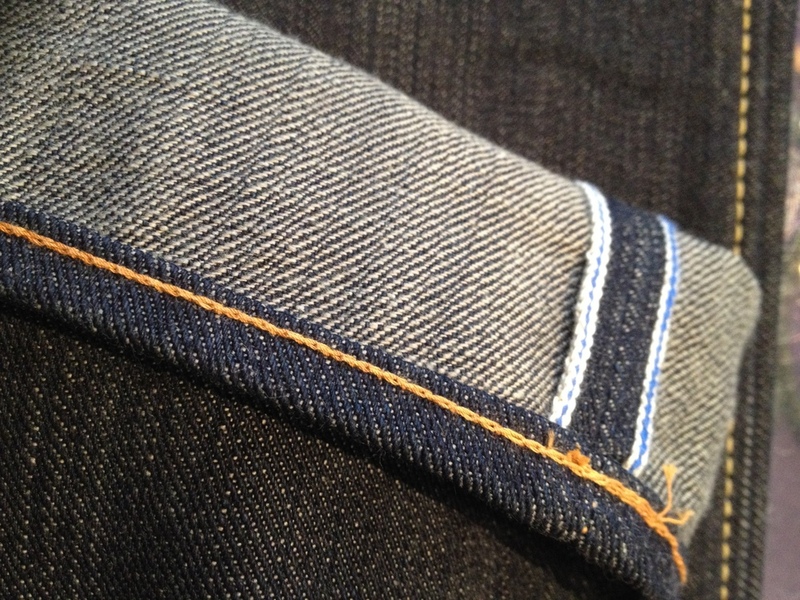 The fit of the denim was very different and catered to a Japanese body-type. Even Heffner said that, above all, finding the right fit is most important when looking for jeans. Unfortunately, I couldn’t find the right fit for my American thighs. So I continued on to find authentic, “made in the USA” denim. I feared I had exhausted my sources. Even Levi’s no longer makes their denim in the States, having shut down their last American factory in 2004. I had one more stop to make: Raleigh Denim + Workshop. My mind starting buzzing with connections and excitement: Raleigh = North Carolina = Original site of Cone Mills = Local Cotton = Made in the USA! I walked into their tiny, boho-chic store and saw the women’s line of denim freely hanging along a line of hooks. The well-informed staff was eager to accommodate. Raleigh prides themselves on contributing to the renaissance of American made jeans using vintage looms and premium local resources. 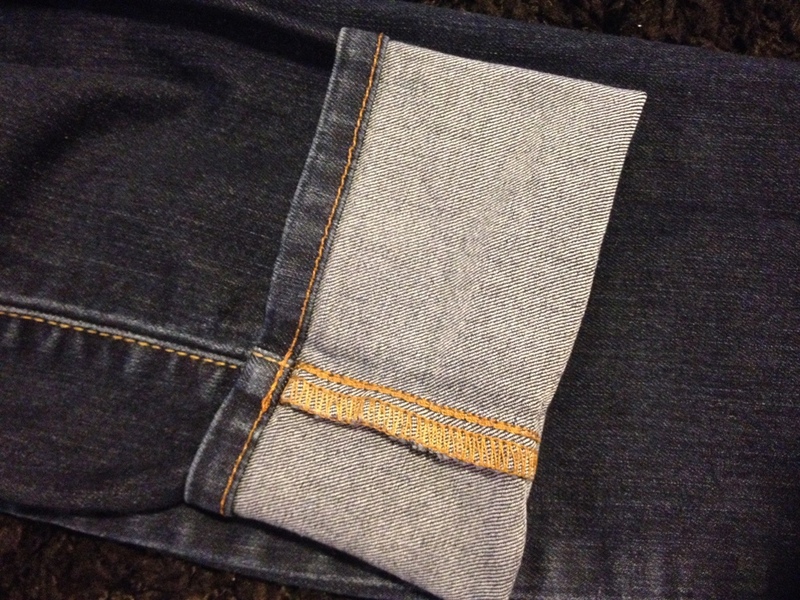 After trying on a few different washes, I slipped on a pair of their Haywood dark washed jeans. 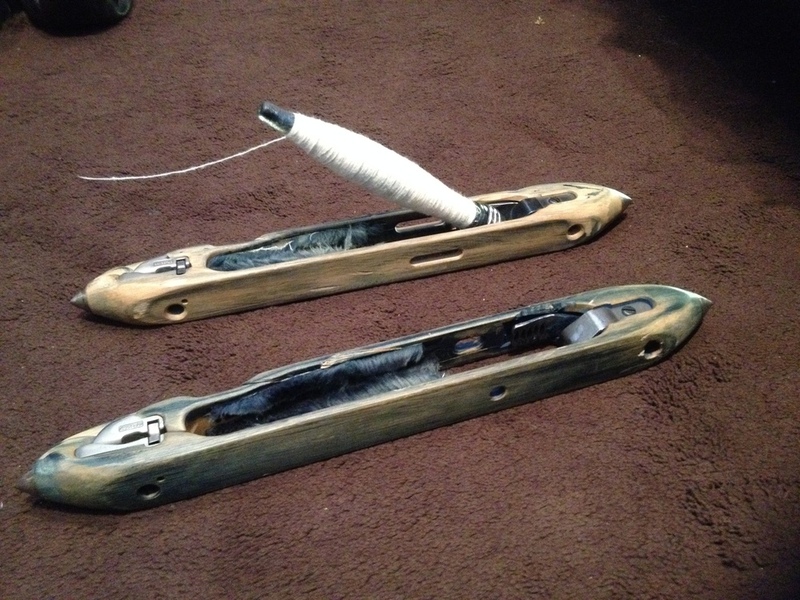 I had found my second skin—custom fit to my American thighs and all! They cost around $200 but the satisfaction of knowing that these would stay with me for a lifetime was priceless. The next day I went off to give my old pairs their proper burial at the consignment store around the corner. May they R.I.P.